What are you waiting for? Isn't it time to get into mile racing? It's easy. All you need to do is contact us via the form on our contact page. Membership provides all the excitement that IMRA has to offer. Join your fellow mile-racing enthusiasts at the next IMRA sanctioned event. 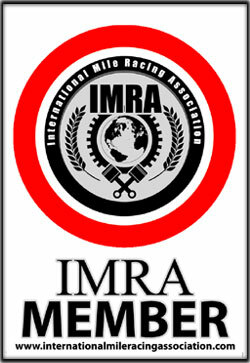 Membership includes eligibility for all Club participation, licenses, discounted entry into IMRA sanctioned events, IMRA membership card, IMRA car decal, discounts on IMRA merchandise and other products and services. Get all this for your annual dues of $75 today.